Total distance: approx. 800 km (500 mi). Tour date: August 1995. Actually I did this tour twice, in 1991 and 1995. The first time I was just moving back from Palo Alto to Berlin, and 1995 the Siggraph convention was in Los Angeles so the opportunity was ideal. The first time I went with an old friend, the second time I went with someone I met in rec.bicycles.rides. This report describes the more recent tour, although we followed a similar route and often stayed in the same campgrounds. The tour starts in San Francisco, where last year's tour ended. This means the usual visiting of friends, ice cream in Sausalito on the other side of the Golden Gate, and generally lots of riding in the Bay Area. In fact, the raw distance between San Francisco is only about 850 km, the rest is riding in San Francisco and Los Angeles. I stayed in the Fort Mason youth hostel, a wonderful place to stay on top of one of San Francisco's many hills, with a view of the Golden Gate bridge. It's impossible to get in without a reservation at least four weeks in advance though. Mason Street YH is a good alternative. 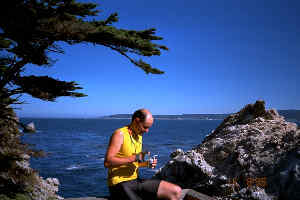 We left San Francisco on Highway 1, which we stayed on most of the way to Los Angeles, almost exactly following the directions in the west coast touring bible: Bicycling the Pacific Coast , Kirkendall and Spring, The Mountaineers, ISBN 0-89886-232-9. Leaving San Francisco to the south is rather boring, Daly City and the other glorified suburban sprawl is certainly not interesting to look at and has lots of heavy traffic and unexpected freeway entrances. It got more interesting after Half Moon Bay, halfway between San Francisco and Santa Cruz. Since I lived in Palo Alto for over three years, I'll list two side trips that I didn't have time for on this trip but that I can recommend: from Palo Alto to Sand Hill, then scenic Old La Honda up the hill, blasting down Highway 35 to San Gregorio at the ocean, up north Highway 1 to Highway 92, and back to Palo Alto along the Crystal Springs reservoir and Canada Road. 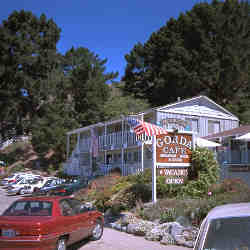 The other starts the same but turns south on Highway 1 to Santa Cruz, where I liked to stay overnight in the youth hostel, and then back Highway 9 extremely early in the morning, through Boulder Creek. The early-morning atmosphere in the dark forest, with no traffic at all, is one of the best rides in the Bay Area, imho. Of course, local cyclists prefer the much tougher ascent to King's Mountain, but I did that too and it gets boring after a while. We had a serious headwind on our first day, very unusual on the coast, so we didn't make it all the way to Santa Cruz. 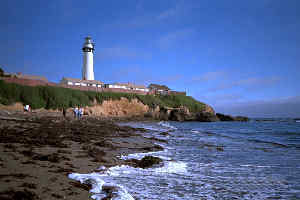 We stayed at the Pigeon Point youth hostel, on a wind-swept little peninsula with a lighthouse, shown in the picture to the left. A welcome change after busy San Francisco. You just sit out on the porch, gaze upon the ocean, watching the surf. Santa Cruz is a busy small university city. They have one of those piers built out into ocean with tourist traps and expensive restaurants built on top of it, plus the unavoidable parking space for people who can't even walk the length of the pier. It's all made of wood, sometimes with gaps large enough for a bicycle wheel to fall into. Santa Cruz also has something they call the boardwalk, sort of a traditional amusement park with a ferris wheel and rides, built on the coast. They don't allow bicycles there and I'd be reluctant to leave it unattended outside. Most of Santa Cruz downtown was destroyed during the 1989 earthquake, I have been there shortly after it happened and remember the collapsed buildings and the large metal tents set up for the shops. It still hadn't fully recovered in 1995 but it has again become a pleasant place for shopping and eating. We left Santa Cruz after a few hours and rode around the Monterey Bay to Monterey. Much of the road between Santa Cruz and Monterey is uninteresting, and traffic is heavy. Monterey has two main tourist attractions, Cannery Row and the aquarium. Cannery Row was popularized by the Steinbeck novel, but personally I just think it's an unsuccessful attempt to restore some fish factories to an elegance they couldn't possibly have possessed when they were still fish factories, hoping to attract tourists. We stayed overnight on the top of the hill overlooking Monterey, in Veteran's State Park. Like most public parks along the U.S. west coast, it has a nice hiker/biker site set apart from the rest of the park where one can meet other cyclists and stay away from the RV parking lot. In fact, since everybody rides north to south we have met the same people over and over again. The tourist office fully expects you to follow the peninsula coastline from Monterey to Carmel, using a toll road called ``Seventeen Miles Drive''. I have ridden it before, it's perfect for people interested in golf courses and tourist shops, and has some nice sights, but cannot measure up to what follows south of Carmel, which is far less ``managed''. We skipped it and rode directly to Carmel. 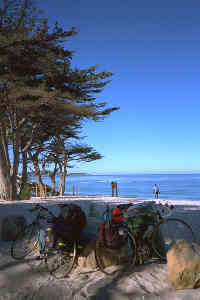 Carmel is a small but extremely affluent town with narrow main street lined by art galleries and bakeries, and a nice beach, shown in the picture. It manages to be quiet and pleasant despite being a tourist attraction. It's impossible to get permission to cut down a tree in Carmel, and it shows. Clint Eastwood was once mayor for one term, I guess they are serious about offenders against the tree protection laws. Just after Carmel, we stopped at Point Lobos, which alone more than compensates for having missed the Seventeen Miles Drive. The teaser image at the top of this page was taken at Point Lobos. South of Carmel, we finally left the urban areas of the Bay Area and entered the Big Sur area. Amazingly, the coast is almost completely undisturbed by development, there are only some small farming communities. This was the best part of the trip. Although I feel that it can't match the beauty of the Oregon coast, which has the advantage of a wetter climate and matching vegetation, the Big Sur stretch of coastline is a sequence of scenic views over small bays with untouched beaches, overlooked by rocky cliffs. Although Highway 1 closely follows the coast, which means constant postcard motives to the right, it is still hilly because the cliffs vary considerably in height. They are no problem for riding because none exceeds 250 meters, and most days we didn't have more than two of these. Of course, the downside to untouched beauty is that there aren't any grocery stores to stock up on water or bananas either. The Big Sur coast is not completely devoid of human civilisation. There are small ``towns'' like Lucia (population 3 according to the Bikecentennial map) and Gorda with grocery stores and restaurants, but they are few and far in between. Stock up on food whenevr you can, and you'll love the rugged untouched beauty of this section of the Pacific coast. The picture was taken in the town of Gorda. I once ate better fish-and-chips there than in London. This picture was taken in the Julia Pfeiffer State Park, a beautiful park in the middle of a redwood forest. 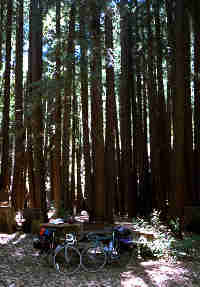 The hiker/biker site is located far away from the car lots, and we got to sleep on soft forest floor under huge trees. The picture shows the usual setup: the table with benches that the bicyles lean against, a fireplace (visible at the left behind the bench), and generally lots of unpaved ground. Most campgrounds have hot showers and some sort of overpriced grocery store. 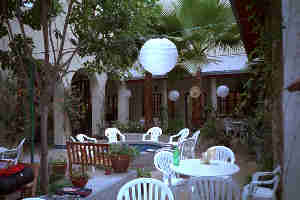 This place also had a fairly good restaurant. Campgrounds on the US Pacific coast are a big reason why riding here is so attractive. They usually have beautiful, secluded hiker/biker sections that are well separated from the car parking lots that pass for campgrounds in other parts of the world. You sleep with nothing but nature around you, and a starry sky like us city-dwellers rarely get to see. If you are interested in senseless wealth (watching, not owning), check out Hearst Castle near San Simeon, 75 km north of San Luis Obispo. They have a visitor center from which tourists are bussed to the actual castle. We skipped that because it would have taken too much time (we were late), but they had enough pictures in the visitor center to leave no doubt that Mr. Hearst was obscenely rich and had no taste whatsoever. Well, he is dead and hordes of tourists now wear down his carpets. If I build a castle sometime I'll make sure to find a less sunbleached desert-like place. Well, I had all the castles I wanted on my Loire tour through France two years earlier. And unlike Mr. Hearst those people know how to build a castle. The area around Morro Bay and San Luis Obispo is a bit hard to navigate because most of the time we rode on residential or industrial roads. San Luis Obispo, or SLO, has a nice downtown if you want to spend the time finding it. We did and found a bike store and many small restaurants. South of SLO, the route returns to the ocean at Pismo Beach, with two public campgrounds the second of which is the better one (Pismo State Beach, not North Beach State Park). There is a nuclear power station near Pismo Beach, conveniently located right on top of an earthquake fault. We passed many tall poles with alarm klaxons on top, just in case the reactor happens to engage in a mishap. Shortly after San Simeon, Highway 1 turns inland towards Lompoc. Most of the coastline near Lompoc is part of the Vandenberg air base, a large military installation. Apparently they tested most of their missiles there, there is a display of many of them, plus two jet fighters, at the roadside. 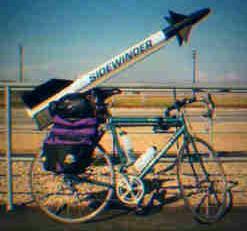 Incidentally, that is where I took the sidewinder missile picture that, after some editing, become the title picture of my bicycle page that brought you here. We spent some time window-shopping but decided to ride on to Lompoc. There really isn't much to see there, just when you think you are finally getting close to downtown you have actually missed it. There are two ways to proceed from Lompoc. One is a quiet inland route through Solvang, a pretty Danish village, and Lake Cachuma, and the other returns to the ocean at Gaviota. On my first trip in 1991 we went through Solvang and liked it; this time it was August and too hot to attempt an inland route so we went along the coast, which had a lot of traffic. If you ride here in May, as we did in 1991, by all means head towards Solvang. Even though you'll miss Refugio State Beach just south of Gaviota, practically on the beach and with a hiker/biker site under palm trees. The hiker/biker site is slightly left of the center of the picture. 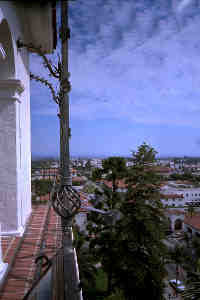 Santa Barbara is a large town with much to see. They have a moderately interesting Spanish mission there (all of Santa Barbara looks Spanish), and a rather impressive courthouse. Visit it and climb the belltower for an excellent view over the city. (This is where I toke the picture to the right.) There is also a pedestrian zone called the Paseo Nuevo with many shops and restaurants, and a bike store. They also have one of those wooden piers with lots of parking and the usual tourist traps, indistinguishable from the one in Santa Cruz. Around Ventura, especially the southern part until Oxnard, is an ugly industrial area, with various military installations, like the aptly named Navalair road. It's better than the Highway 1 it parallels though because it has little traffic. The last really pleasant place to stay was Leo Carillo State beach, a campground with a quiet hiker/biker site in a small forest, far away from the motor campers. Actually, we couldn't get into the Santa Monica youth hostel the next day because we were one day early, so I rode back to Leo Carillo because it was such a nice and quiet place. There isn't anything to see between Ventura and Los Angeles, not even Malibu. It's an unremarkable place trying to hang onto both sides of Highway 1, which at that point has become a very busy six-lane road. Many rich people live there, but not down at the coast but in the Malibu hills where no tourist will ever find them. We didn't bother. I am afraid I can't think of anything positive to say about Los Angeles. It's an endless ugly urban sprawl with a traffic problem that defies description. One third of the surface of Los Angeles is paved, including their only river. It's good only for film car chases. As one guide put it, Los Angeles is ``19 suburbs in search of a city''. Actually they do have a downtown, divided into the commercial part with high-rise office buildings that is so boring that it drives one to tears, and the Broadway area which is a shabby commercial street with shops, but it feels more like a Spanish-speaking third-world bazaar. I wouldn't go there at night because I'd probably end up as an organ donor or a hamburger ingredient. Most of the other ``attractions'' of Los Angeles, such as Beverly Hills, are in the same category - none comes even remotely close to the image they try to project. The only redeeming quality of Los Angeles, and also the reason why two of my tours ended there, is that it has an international airport so it's easy to get out, fast. I spent most of the remaining time in Santa Monica, with a few excursions downtown (a very long and unpleasant ride) and to the UCLA area, which is sort of OK but not very interesting. 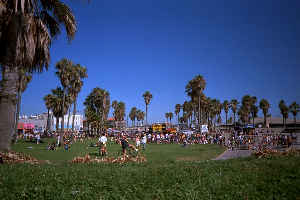 Just south of Santa Monica is Venice Beach, which I suppose is a must-see for Los Angeles visitors because it is a model for everything non-Californians think California is all about, namely, beaches, surfers, musclemen and blondes. To me it seems more like a Disneyland designed to confirm the misconceptions of tourists. In 1991 we attempted to ride south along the ocean, towards San Diego or at least Huntington Beach. We didn't make it. Who else but Los Angelenos would build endless refineries right on the beach? The ride was life-threatening because there were industrial plants on both sides of the road (well, they looked like refineries) and very heavy truck traffic with absolutely no patience for cyclists. We gave up in Long Beach. I still don't know why they call it long beach, it's 100% concrete and asphalt and a rotting cruise ship.